It was the warmest night of the trip, with little need for more than a blanket. Today we do not have far to go so we can have a late start. We have a relaxing start and leave the caravan park at 9:30 am. 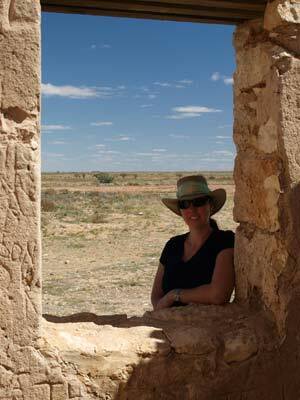 We drive back to the Diamantina River which is on the eastern side of the town. There are a number of branches of the river here. The river is flowing quite well after the recent rain. We go to the old causeway crossing and then come back into town. We stop at the old Australian Inland Mission hospital which has a very good display about the remote hospital and the forerunner of the Royal Flying Doctor Service. 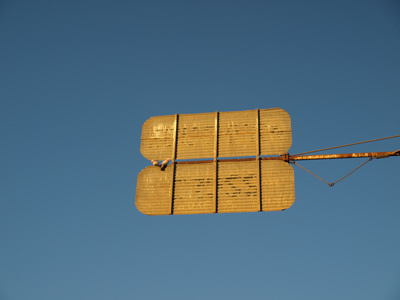 It is well worth looking at this when you visit Birdsville. There is also a nice park with toilet, water and a kids' play area next door. Next to this are the remains of the Royal Hotel which was built in 1882. It was later used as the hospital and other uses. Birdsville has an interesting power station. This uses geothermal energy to make electricity. 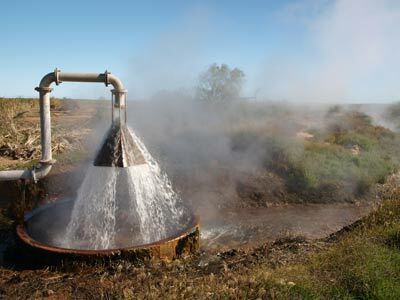 Simply put, a liquid with a low boiling point is pumped into the Earth and put in contact with the very hot thermal waters in the artesian basin. The water is 98ºC. The liquid turns to gas and then comes back up and drives the power station's turbines, generating electricity. It is cooled and the cycle starts again. We drive up the street to look at the water from the bore which comes out and is cooled before being used as the town's water supply and then at the power plant. We drive to the petrol station opposite the hotel and refuel. This is much cheaper than the big petrol station outside the caravan park. I take 73.5 litres @ $1.47 a litre = $108.00. 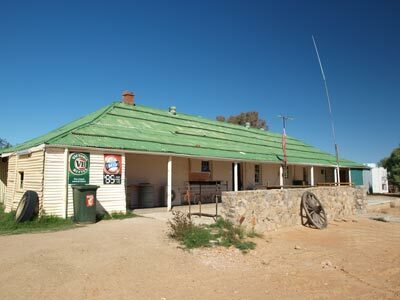 At the same time, we take some photos of the Birdsville Hotel and Kelly puts a St George Scuba Club sticker on the bottom of the main fridge in the bar. 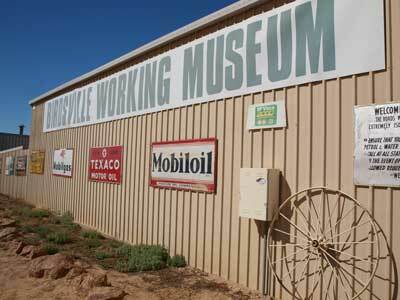 After this we drive the short distance to the Birdsville Working Museum. This is a fascinating place where you can spend hours. It was advertised that there was were tours but we find out on arriving that tours are no longer run. Instead, you just wander through by yourself. Not as interesting without the banter from the owner, John Menzies, but still great. It costs $10 per person and has so much on display to show what it must have been like to live in Australia in the 1800s, early and mid 1900s. We spend over an hour in there. Some of the special things to see include many different types of water pumps, from simple chains that drag the water up to steam pumps. There is even a Furphy! 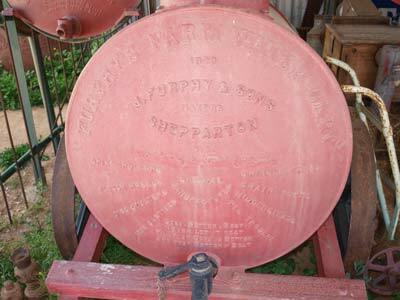 This is a water tank and where the saying comes from. It would have been good to see the pumps running like they used to on a tour. After the museum, we have lunch at the Birdsville Bakery. I have a curried camel pie! Excellent. We go back to the main petrol station which also houses the town's only food shop. We get some bread and other things. 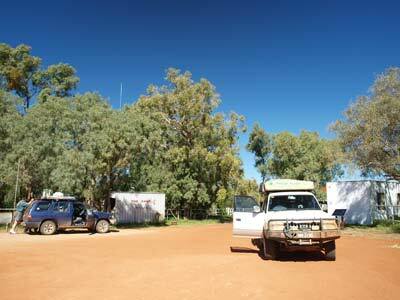 It is 12:20 pm when we leave town and head off along the Eyre Developmental Road towards Boulia. Our original plan was to only go as far as Cacoory Ruins. This is about 80 kilometres north of the town. However, as we have left a bit earlier, we decide to go a bit further. We end going a lot further. 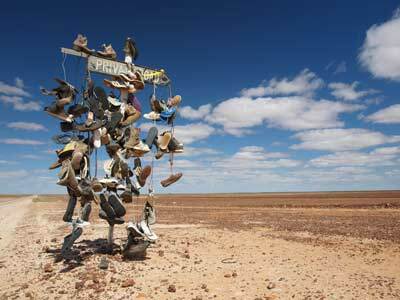 About 30 kilometres out of Birdsville there is a road sign that has been made into a "shoe tree". There are dozens of old shoes and thongs on it. At 1:22 pm we arrive at the Cacoory Ruins and have a quick look. 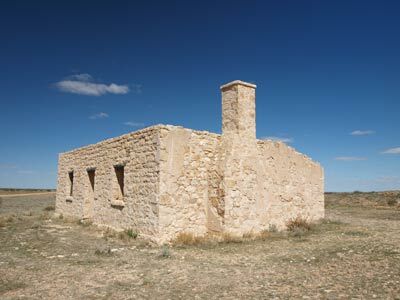 There is only one building and some foundations, not as much as I had thought there would be. It would have been an alright place to camp. We head off at 1:30 pm. 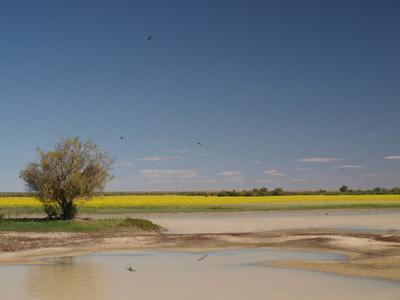 A short distance along we cross Eyre Creek and there are large fields of bright yellow wild flowers and many birds. 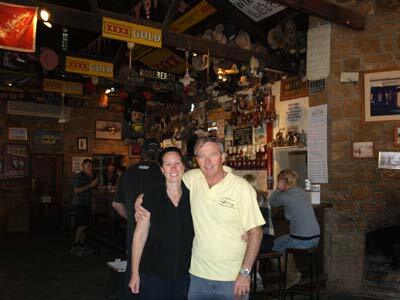 At 2:55 pm we arrive in Bedourie and stop at the Bedourie Hotel for a beer ($5 a stubby). 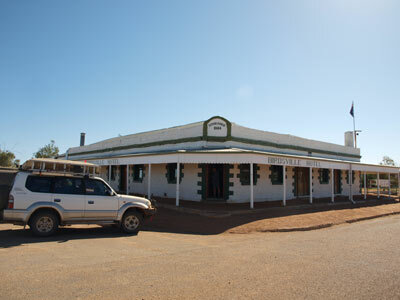 The hotel was built in the 1880s as was the mud hut across the road. There is a nice public toilet and park with barbecues. This really is a one street town. We head off at 3:23 pm. 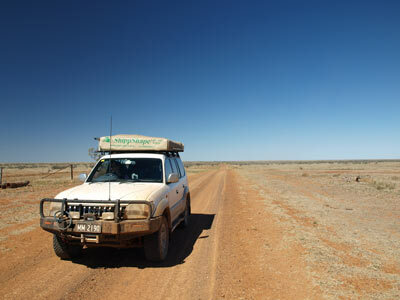 The road from Birdsville has a lot of tar and is probably 40% tar now. At 4 pm we arrive at the Canendula Channels and see a spot on the left between two of the channels that is an excellent camp site. It has a track that loops into the site and is clear and flat. 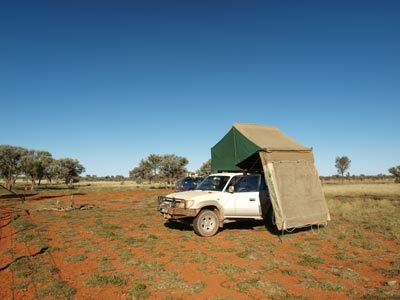 We set up camp and revel in the birdlife. There are thousands of swallows living around the small pipe bridges over the channels. There are also lots of whistling kites, other hawks, budgies and more. 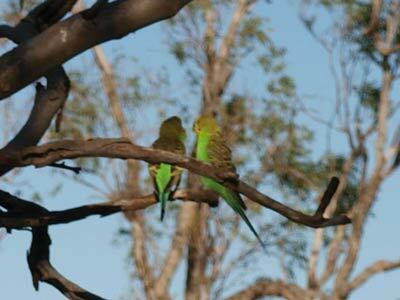 The tree right next to the camp site has about four pairs of nesting budgies. We can get very close to them and get some nice photos. As normal, we have pre-dinner drinks and then I start a fire. Kelly is cooking a marinated piece of lamb that you can get from Woolworths. It is vacuum sealed and lasts ages in the fridge. Kelly plans to braise it and then wrap in foil and slow cook for 40 minutes. We have vegies and rice with this. It is a brilliant meal, the lamb is so tender. After dinner we watch the stars. 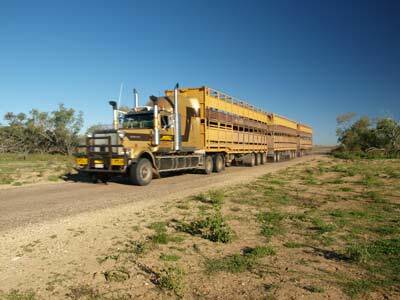 During the evening, three large road trains carrying cattle or sheep go past. We go to bed about 9:30 pm as usual and then read for a while. I am happy, we are a bit ahead of schedule, having got a lot further today than planned. Today is potentially another long drive, so we are up at 7:15 am. It was pretty cold last night and is still very cool this morning. We depart at 8:30 am and continue north. 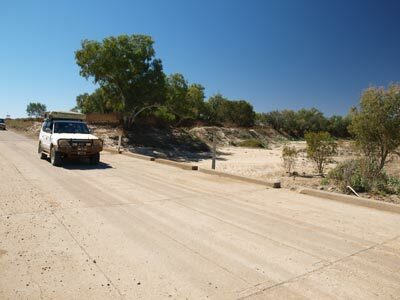 The road from here is the Diamantina Developmental Road which came off the Eyre Developmental Road south of Bedourie. This road used to be totally dirt. Most of the maps I own still show it as 100% dirt. However, it is now probably about 40% dirt and 60% tar. The sections more likely to be affected by rain have been tarred. 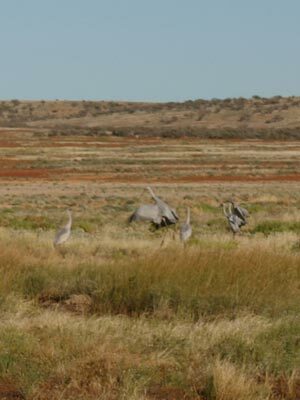 Eleven kilometres north of our campsite we see some brolgas off to the left. There are about six of these large and majestic birds. They are not very commonly seen. We also see some emus. One of them has chicks and they run across the road in front of us. I manage to get a photo of them from out of the window. We make pretty good time and cross the Georgina River at 9:30 am. This has some nice camp sites. 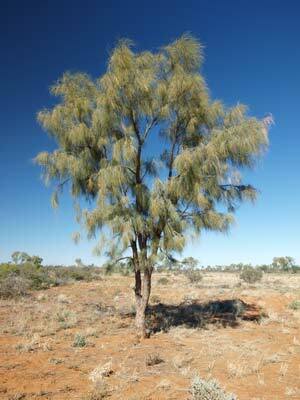 At 10:10 am and 125 kilometres north of our camp site we come to a small area of strange trees. 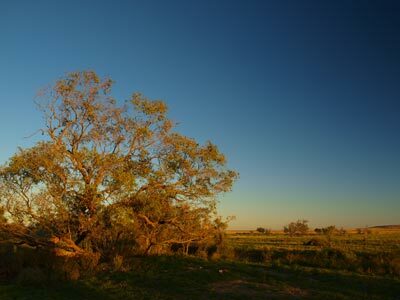 These are waddi trees, an acacia, that is only found near Birdsville (look as you head north) and over in the Northern Territory near Old Andado. Apparently seeds from these trees were found in Wills's diary when it was found at the Dig Tree after his death. 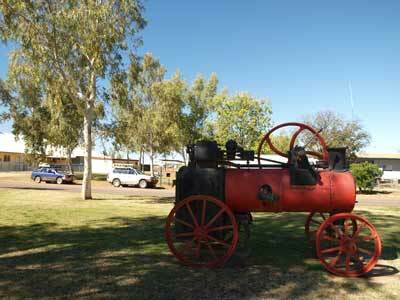 We are back on the road within a few minutes and at 10:28 am we arrive in Boulia. This is a nice little town, with mobile phone coverage. 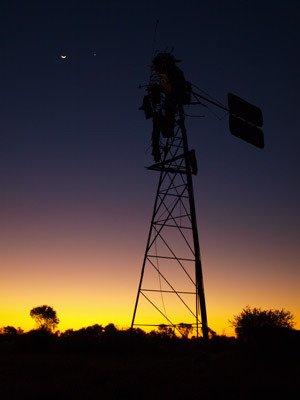 We have not been able to use a phone since Thargomindah as the network was down in Birdsville. It is good to be able to check on how my family is coping after Dad's death. We need to refuel as the next couple of legs are quite long and there is only one refuelling location between here and Alice Springs. It is this section that Peter F may need at least one of the Jerry cans of fuel. I take 55.9 litres at $1.449 a litre = $81.10. We then drive to the small park next to the Police Station and have morning tea. This has some covered tables and toilets. 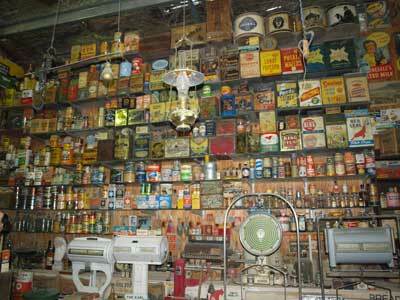 There is also a good supermarket and hardware store if you need anything. We head out of town at 11:07 am. 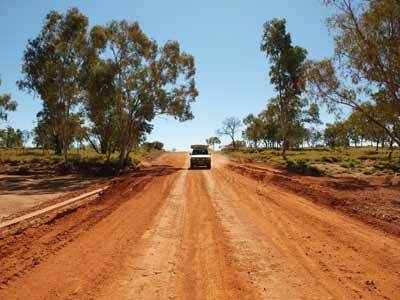 We take the Diamantina Developmental Road north. As we leave we see a very tame emu and chicks next to the road. Eight kilometres out we turn left onto the Donohue Highway. This heads west towards the Northern Territory border. 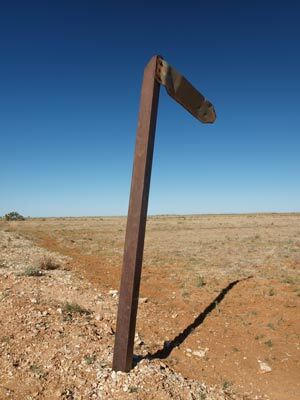 It is 806 kilometres to Alice Springs and the road is tar for 23 kilometres from Boulia. At 12:35 pm we cross the Georgina River yet again. 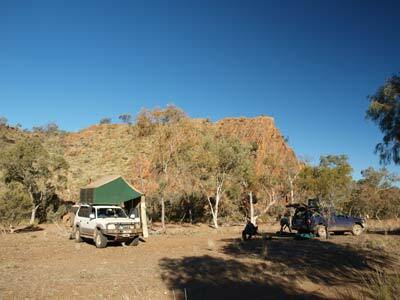 On the eastern side of the river and on the north side of the road is a good camping site. We stop here for lunch, annoyed a bit by the flies, the most we have seen so far (in fact, the worst we will have on the whole trip). 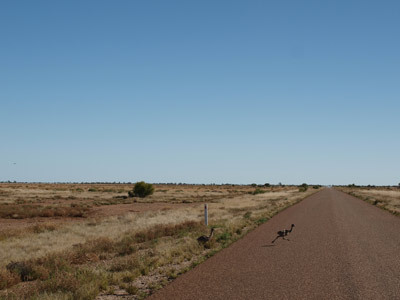 The road to here has some patches of tar, about 10 kilometres near the river and 15 kilometres back towards Boulia. 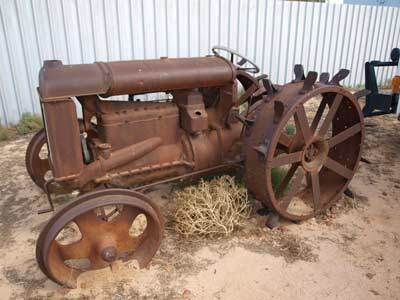 We have only passed one vehicle in the 90 minutes since leaving Boulia. We head off west at 1:10 pm and there is 4.5 kilometres of tar before the dirt returns. It is a single lane dirt road for quite a while but we can sit on 70 km/h easily. There are some newly constructed gravel and a small bit of tar before some more new gravel. 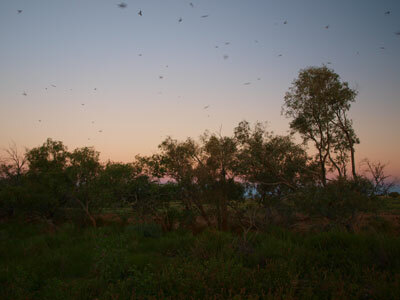 About 50 kilometres from the Northern Territory border we run into a large swarm of locusts. They crash into the car, almost blocking vision for a few seconds. 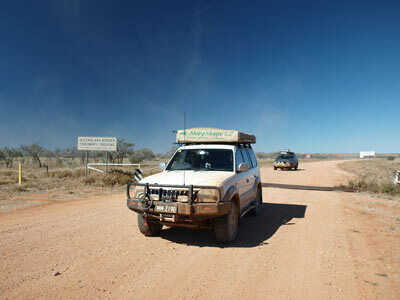 At 2:50 pm we cross the border and enter the Northern Territory. 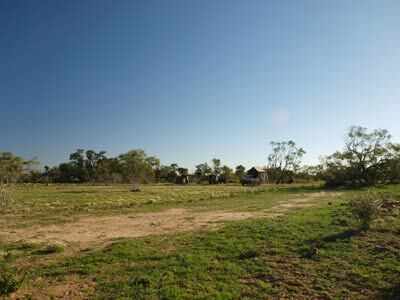 This whole part of Australia is normally very dry and harsh, but the rain that fell early in the year, followed by the rain in July, has made it a very lush landscape. We have travelled 250 kilometres from Boulia. 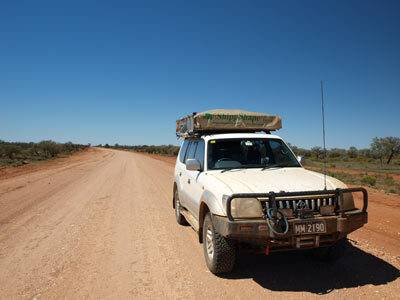 The road in the NT is called the Plenty Highway and is not as good as the Queensland part. There were lots of corrugations and a section where major road works were underway. Kelly has been driving since lunch and later says it required a lot of concentration. At 4:05 pm we spot a windmill off to the left of the road. It has a large concrete water tank and many trees. 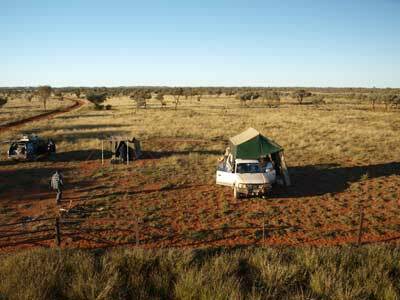 We decide to camp here as it is the only place we have seen for the past 20 or so kilometres worth stopping for the night. This is called Heartbreak Bore and it is a nice spot. 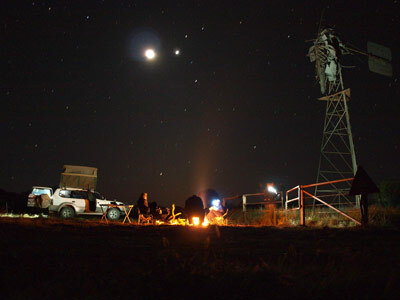 We camp on the southern side of the windmill where it is nice and flat. We collect some firewood and get ready for drinks and dinner. There are a lot of birds around, zebra finches, crested pigeons, galahs and some budgies. Later we saw some brolgas. The water in the tank was putrid, quite disgusting looking. We start the fire and after drinks and nibblies, Kelly cooks chicken and cashews stir-fry with two minute noodles. After, I cook some scones in the camp oven for morning tea tomorrow. The sunset is quite spectacular and I get some really nice shots of the windmill. After dinner, we read using head lamps and go to bed at about 9:30 pm. It was cold last night, the coolest for almost 14 days. 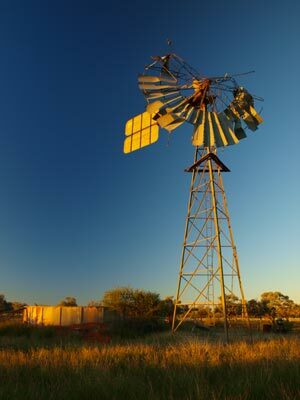 I am up at 7:25 am and after breakfast I climb up the windmill to take a photograph of the camp site. We leave at 8:35 am. Although we do not have to travel a huge distance today, there is the possibility that the road conditions may not be so good. There was 75 mm of rain in this area in early July so the road may not be it the best of conditions. I had noticed that shortly after this rain, Google Maps for the area showed lots of water all over the place, including across the road at the Plenty River. Shortly after getting back on the Plenty Highway we see eight kangaroos, the most we see anywhere on the whole trip. 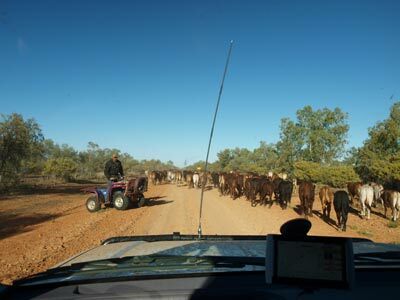 A few kilometres along we come across a mob of cattle being herded along the road. This does not seem to be a normal station mob, perhaps it is a cattle station where people can stay and join in with the mustering etc. We cross Alegra Creek and spot a red-backed kingfisher on a sign on the western side. Off to the left are some hills, the Umberumbera Range. About 20 kilometres before the hay River we see a bustard, a relatively rare bird that was almost wiped out for food. We cross the Arthur Creek/Hay River at 10 am. This appears to be the same watercourse, but to the north of the highway it is called Arthur Creek and to the south Hay River. 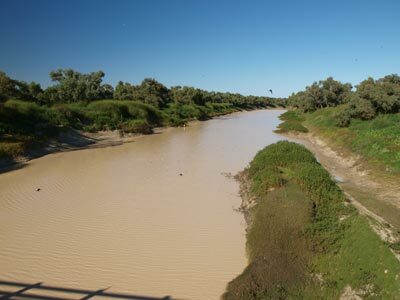 It is quite common in the Australian outback for a river to have a number of different names, given by different early explorers not knowing it was the same river as someone else had discovered and named earlier. 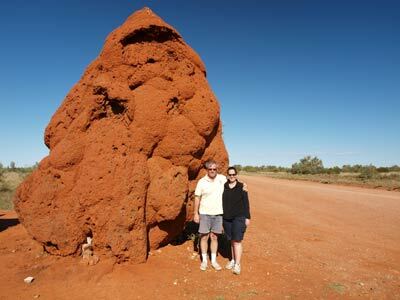 At 10:10 am and 13 kilometres from the Arthur River there is a huge termite mound on the left side of the road. We stop as it is at least four metres high, the largest we have ever seen. We have travelled 97 kilometres in the past 95 minutes. We are back on the road at 10:15 am and at 11 am we pull into Jervois Station (a few hundred metres off the highway). This is a cattle station that also sells fuel and some other basic items (do not depend on getting anything here). It also has a nice camping area. 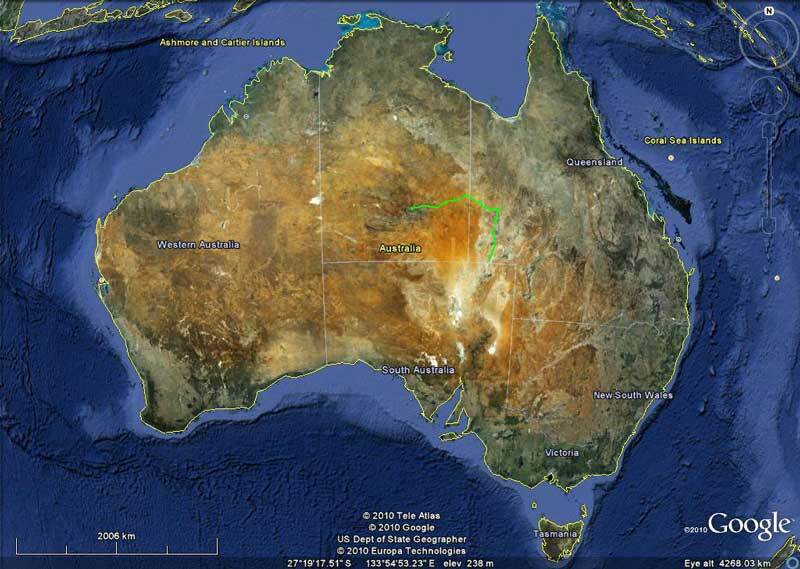 We need to refuel here as it is over 950 kilometres from Boulia to Alice Springs. I only put in 50 litres (at $2.07 a litre = $103.90) as I still have quite enough fuel left. I will probably be able to make it easily without refuelling, but it is better to be safe. This fuel was premium unleaded as they only sell this and diesel. It is now fairly warm, 27ºC. After refuelling, we head back to the highway off and stop at the rest area before the Marshall River were we have morning tea. You could also camp here. We left at 11:37 am. 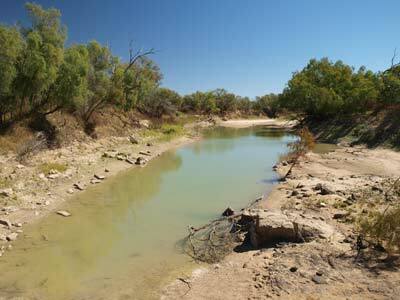 About six kilometres along we cross the Plenty River. There are a couple of channels here. You could camp here as well, but the rest area north of Marshall River would be better. There are more hills to the left and we decide to go into the Aboriginal town of Atitjera and perhaps have lunch here. However, everything is closed, the store and the cafe. It is quite a depressing place, with junk everywhere. Why cannot the Federal intervention include a cleanup of old cars and rubbish? There is nowhere even to stop to have our own lunch so we go back to the highway. We have lunch at the intersection (1:35 pm), adjacent to the power plant (not a great spot). We head off at 2 pm. We pass the brand new Harts Range Police Station a short distance down the road. There are good views to the Harts Range off to the left. 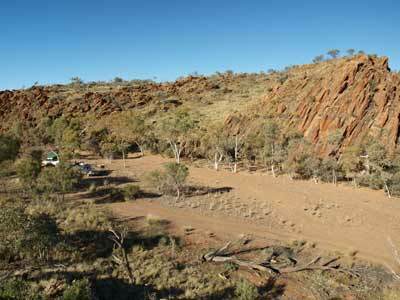 About 45 kilometres from Harts Range we see a sign to some gem fossicking areas as well as a large sign with some 4WD tracks marked. We see the track we are looking for and comment how stupid it is to have the sign here, a few kilometres short of the actual track. We continue west and turn left just before Ongeva Creek down a track that is marked on my computer based maps and my atlas as the only road south. It is also marked as Cattlewater Pass on one computer map and the topographical maps. It is 2:45 pm. This road is quite good but after a few kilometres it appears to come to an end. Have we missed a turn? We head back and just as I approach what appears to be the road (now overgrown) Peter F reports on the radio he has a flat tyre. Kelly is driving his car as Peter was tired. 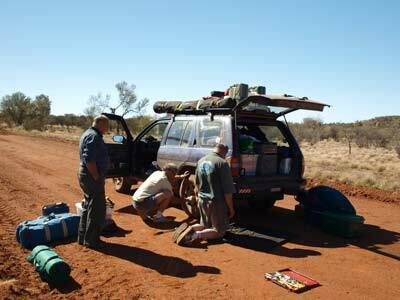 I head back and we change the tyre in a few minutes. Note the No Through Road sign! I have another look at the end of the track but it certainly goes nowhere. We head back and take the overgrown track. Peter has now finished putting everything away and is following. It is certain no-one has been down this track for a long time, perhaps a year. However, we can go forward, with some small diversions around fallen trees and huge ruts. 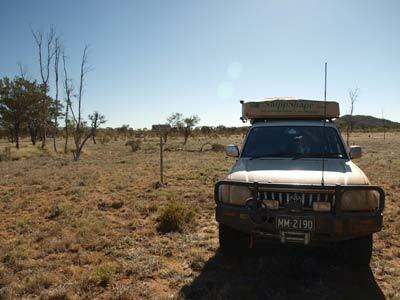 The track has a lot of soft sand and we have to drive through a lot of Spinifex grass. It is a goat track, but no worse than some tracks we have driven in NSW. At 3:25 pm we come to an intersection. Well, this looks like the right track. The one we have come down has a sign saying "No Through Road". We continue on this road which has obviously come from where we saw the large sign on the highway. This track is a lot better, but still slow going. The road crosses the Ongeva Creek a few times. At 4 pm we come to another crossing and then we pass through a "pass" with a nice flattish grassed area on the left. This is a stunning spot so we decide to camp here. It is very warm, 28ºC, as we make camp. There is a lot of firewood around and I climb up the rocks to the west to take a photo of the camp site. We start a fire as we need it for dessert cooking later. We have a few drinks and nibblies and Peter F makes spaghetti bolognaise. Meanwhile, Kelly has been preparing dessert. She is cooking sticky date pudding (recipe from MasterChef). After dinner, we cook them in the camp oven and Kelly makes some butterscotch sauce. Magnificent! Just before dark two cars pass, one is a RAV4 heading south and the other a LandCruiser heading towards the Plenty Highway. A bit late to be still travelling! We later meet the two women in the RAV4 and found that it was well after dark that they arrived at their accommodation at Old Ambalindum station (see tomorrow). We go to bed at 9:30 pm and read for 30 minutes.